You need someone to oversee your financial matters if you become incapacitated, for example, because of injury. 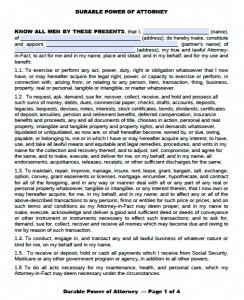 The documents are flexible. You can make them to suit specific needs. For example, you can authorize just one power, such as writing checks for you for a three-week period, if you know in advance that you will not be able to do so during that time. You can also authorize the agent to perform almost any financial or property transaction you can, which is more appropriate for unforeseen situations. 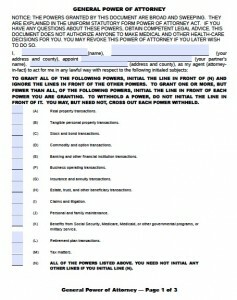 By executing a power of attorney, you can authorize an agent to perform the following acts on your behalf.